Are you a photographer, video production company owner, or content creator looking to grow your business? One of the most challenging aspects of running a creative business is the constant need for new clients every single month. In this article, I will reveal my top 10 ways to get consistent new clients for your business, plus some bonus client outreach strategies you can implement to supercharge your growth. The biggest problem I see content creators make is they rely on the quality of their content for generating new clients. Although the importance of good production can’t be overstated, this isn’t an effective marketing strategy. The best way to find clients for your video production company is by actively seeking potential customers. There are too much traffic and competition on the internet to expect clients to see out your work. You must be actively seeking their business instead. 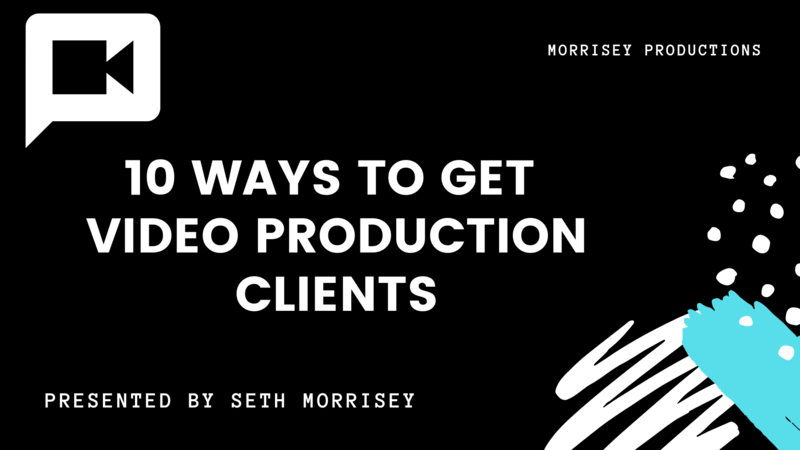 Here are some helpful tips for generating clients for your video production company. Cold calling is one of the oldest forms of marketing. Despite its age, this form of outreach is still highly effective when combined with modern technology. Instead of making phone calls, you can reach out to potential clients via email or direct message. It is helpful to have a script pre-written to help speed up the process. You should make an effort to use this cold outreach method at least a few times per day. This will greatly improve your chances of finding work. Networking is the most important aspect of marketing in any industry. The same is true for video production. You can find a lot of work through a network of other freelancers. A friend who takes photos may be able to refer a client who needs video production. In exchange, you could keep an eye out for clients who need some photography skills. You can even team up with other freelancers who specialize in different areas. Your combined skills can be offered to potential clients as an entire package. Together, these outreach methods are more effective than cold outreach because there is already an established connection between you and potential clients. There are many events focusing on video production and marketing. While these are great places to learn more about the craft, these events are also opportunities to meet potential clients. These niche events are not only attended by experts in the field. Companies in need of video production will also attend the events to look for the best service available. This is a great chance to get your company some exposure. Depending on your level of expertise, speaking at these events is also a great way to establish a reputation as an expert in the field. Hosting your own event can also place you as a leader in the industry. One of the best ways to attract new clients is to offer free value upfront. When people search online for solutions to their problem, the company answering those questions will immediately gain their trust and recognition. These people will also be more likely to do business with the person or company who provided these answers. You should be actively creating helpful content online in the form of videos, blog posts, or an email list. For example, you could create a video explaining how people can find the best video production company. Everyone searching for this information will be a potential client. As the person supplying them with this information, you’ll immediately be at the top of their list for companies to use. Email marketing is still one of the most powerful forms of marketing. Although social media is increasing in use and importance, people still check their emails on a daily basis. A majority of your potential clients will prefer to communicate via email than other forms of contact. This reality makes email marketing an essential part of your funneling process. In order to use this form of marketing effectively, you need to capture emails of your potential clients. This can be done in a variety of different ways. One of the most straight-forward methods is to visit the websites of clients with whom you’d like to work and check their contact information. Active marketing requires that you seek out potential clients. You’ll find that your target audience tends to spend time in the same online spaces. Because they are in the same niche, they have the same problems, questions, interests, and solutions. Frequenting these client spaces can help expose your production company while also establishing you as an expert in the field. These spaces can also keep you up-to-date on the latest trends and need within the niche. If everyone is discussing a new problem, you can be the first to offer a unique solution. There are endless benefits to frequenting these client spaces. They can come in the form of niche blogs, forums, social media platforms, and more. Finding potential clients doesn’t always have to be a game of hide-and-seek. Although the internet is crowded with thousands of competitors hoping to land the same clients, sometimes finding work can be quite simple. There are companies and individuals actively looking for quality video production. Instead of assuming they will find your content, you should take time to search for their advertisement. There are countless job boards where clients are requesting video production work. Finding clients couldn’t be any easier. Sites like UpWork, Freelancer, and ServiceSpace are great places to find clients who are in need of video production. You should have a portfolio and resume ready to send out to these potential clients. While actively searching for clients is one of the best forms of marketing, many people don’t have the time to dedicate to this process. Fortunately, there are paid advertising options that can generate a nice return on your investment. The trick is knowing where to advertise and how to generate a compelling campaign. Social media platforms are great places to start advertising because of the targeting measures that can be used. For example, production companies that specialize in wedding videos can target their ads to engaged couples. Nobody can expect to land new clients without a strong portfolio. Potential clients will want to see your previous work in order to get an idea of your capabilities. If you don’t have any prior clients, make some of your own content. You only need a few pieces of production for a portfolio. As long as the content is good, clients will only be interested in seeing a few selections. Finding clients for your video production company isn’t impossible. However, it does take a lot of hard work, dedication, and consistency. The most important part of marketing is being active. You should focus on finding your clients instead of hoping they find you. This change in mindset will be transformative for your career. Ready to get started? Click HERE to hire an Oregon based Video Production Company.